The Forsters of Alwinton Parish, Northumberland, and the truth about Bygate Hall! I’ve been in eighteenth century Northumberland visiting all the families in the Coquet River valley! Time travel courtesy of the handwritten Allenton (Alwinton) parish registers. They were so interesting I read through the lot. It took a few days on the microfilm readers at HAGSOC (my local genealogical society). You can see the recurring combination of family names and farm names, recognise each separate family and farm despite name and spelling variations and enjoy (as tis said), ye arcane terminology, appreciate the Minister who adds little extra details to the record, feel sad as his writing becomes shaky and the next burial is his own. 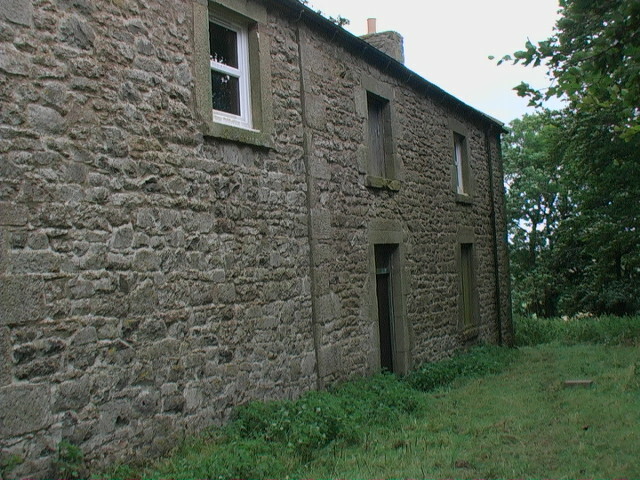 Bygate Hall, Makendon, Loungesknow, and Sirdhope, all fine sheep-lands, were sold in 1792 for £16,000 by the late Matthew Bell, Esq. of Wolsington, to the late John Carr, Esq. of Dunston, in the county of Durham. Anyway, Back to the parish register. No Forsters at all are mentioned in it until 1727 when one or two marry into the district, including William Forster of Rothbury Parish who married Mary Taylor of “Make a dean”, presumably Makendon, a farm on the Coquet even more remote than Bygate Hall, right up on the Scottish border. These two are the probable parents of our Luke Forster. We know our Luke was probably born in 1741 because of the age given in his later death entry shown below. William Forster had two sons, Mark, born at Peels in 1738 and Luke born at nearby Harbottle in 1741. Both boys are among the “births of protestant dissenters” in the register. Just a year after Luke’s birth, his father William Forster of Harbottle is listed among the burials. I wonder if his widow is the Mary Forster of Harbottle who two years later in 1744 married James Stevenson also of Harbottle? It must have been hard raising children as a widow. In 1773 Luke marries Mary Stokoe. Here’s the entry for both the banns (where the Minister misspelled her name “Stoker” and where we see that both are living and presumably working at Bygate Hall before their marriage) and the marriage entry with both their signatures. Luke Forster could have looked something like this while working at Bygate Hall. Below is the much later 1806 death entry for Luke Forster, “labourer” who died while working at another farm, Sheep Banks. At this period the death entries are really informative and it runs across two pages of the register. Death of baby Elizabeth Forster, daughter of Luke Forster at Bygate Hall 1776. Image from Alwinton parish register. No baptism seems to be recorded for this child who died in 1776 so perhaps this first Elizabeth was stillborn. At this period, age at death was not being recorded in the register. The name of her mother must be an error. There will only have been one Luke Forster fathering children at Bygate Hall at the time and his wife’s name was Mary nee Stokoe. At some stage between the birth of their son Mark in 1782 and Luke’s death in 1806 Luke and Mary left Bygate Hall and went to work elsewhere in the Parish. They may have been at Bygate Hall for as little as ten years. Son Mark went all the way up to Paxton in Scotland to be married to Margaret Wilson in 1801 though she was probably a neighbour. I wonder if that was to do with them being Presbyterians or to do with the marriage laws being different up there at the time? There were many other Alwinton entries relevant to our family, especially to the Wilsons, who seem to have been in the district well before and well after the Forsters. After their marriage Mark and Margaret went to Rothbury to set up home and business, but that’s another story. *Historical, Topographical, and Descriptive View of the County of Northumberland, and of those Parts of the County of Durham situated North of the River Tyne, with Berwick Upon Tweed, and brief notices of celebrated places on the Scottish Border. Mackenzie, E. 2nd Ed. 1825. Full-text online via google. Parish registers on microfilm obtainable from LDS via genealogical societies. Byegate Hall, Northumberland. © Copyright ian shiell and licensed for reuse under this Creative Commons Licence. Photo © Copyright ian shiell and licensed for reuse under this Creative Commons Licence. 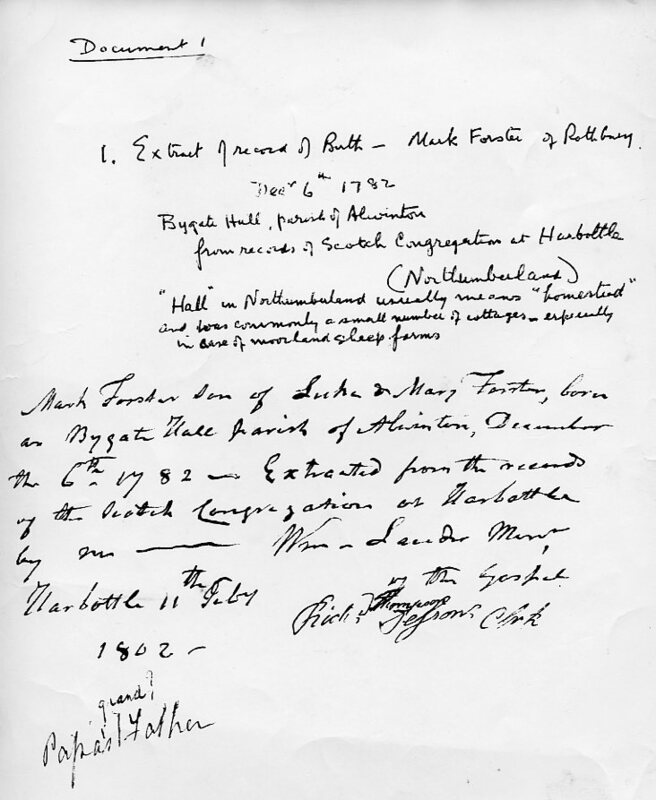 Have been trying to find out more about Bygate Hall, where Mark Forster was born 6 Dec 1782 according to this document. 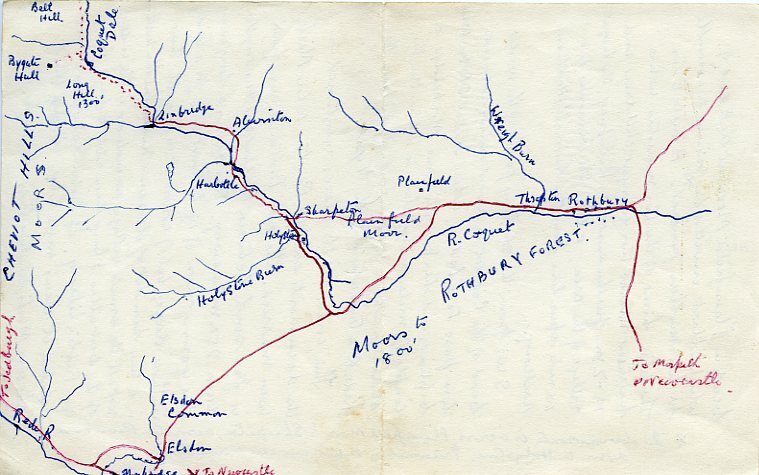 Jack Forster drew this map showing where the home was located when he visited there in about 1962. If you search Bygate Hall on the web you find “Bygate Hall Cottages” by the Coquet River, but these are not located in quite the right place according to Jack’s map. The link below shows both Bygate Hall Cottages where a stream called Croft Sike joins the R. Coquet, as well as the place which Jack indicated, which is midway between Bell Hill to the north and Long Hill to the south and well to the west of the Coquet River and called “Byegate Hall”. You might need to track to the south-west and zoom in as the map doesn’t seem to open at exactly the spot I intend it to. I think “Byegate Hall” is where Mark Forster was born. They were less pedantic about spelling back then. It’s certainly the place Jack Forster meant, and Jack led us to believe that it was the Forster’s ancestral home. Here are more photos of Byegate Hall, now apparently abandoned if not derelict If you want to copy them be sure to credit the photographer. Just to muddy the picture though, Google quickly finds a reference from 26 June 1760 to “William Marshall, Byegate Hall, gentleman” and from 15 Aug 1810 when a John Marshall of Byegate Hall, farmer, died of consumption aged 24 and was buried at Burness, to the southwest of Bygate Hall. These two dates straddle the 1782 date of Mark Forster’s birth, so where do the Forsters fit in at Byegate or Bygate Hall? Postscript: Have answered my own question after spending a few days reading the Allenton (Alwinton) Parish register. Many people lived at Bygate Hall – it was pretty much a small village in itself in the eighteenth century. The Forsters were definitely employees! More in a later post. The first “family historian” I met was John Arthur Blackett “Jack” Forster who visited my parents in the early 1960’s to look at our family documents and returned to regale us with details of his trip to Northumberland where he spent time cross-checking our documents in parish registers at Rothbury and Alwinton. From him we first learned about the Forster ancestral home Bygate Hall, which he also visited. He was then a retired metallurgist. My father’s cousin, he was the eldest son of Arthur Edward Blackett Forster who was the eldest son of William Mark Forster. You can find him in my family tree (the link to it is on the rhs of home page). I’ve copied the major documents from his research for anyone who is interested. See “Early Forster documents” under the “Image gallery” tab above. His research was methodical and accurate as far as I can tell, except for the label on the portrait discussed in the last post. 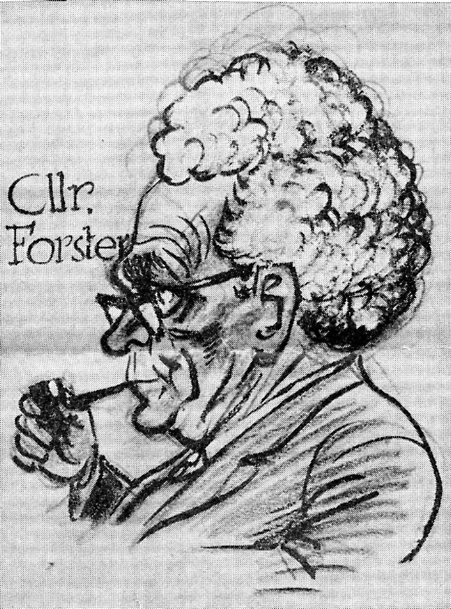 I don’t have an adult photo of Jack, but this caricature from an unspecified newspaper in his Shire Councillor days is so very much as I remember him.